The lacewings listed here, and other less common species, are important natural enemies native to the Pacific Northwest. 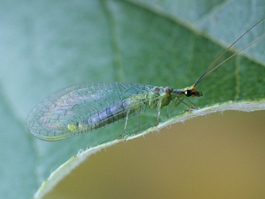 Green lacewings are widely distributed and are important generalist predators. They are often abundant in orchards where IPM is practiced and feed on a variety of insects. 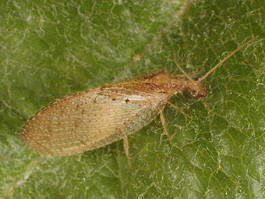 Although less well known, brown lacewings can also become abundant in orchards where soft pesticide programs are used. Lacewing larvae are active earlier in the season than many other predators and are good biological control agents for early season pests. 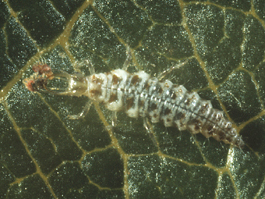 Inundative releases of lacewings have been used to control mealybugs and variegated leafhoppers in California. Both green and brown lacewing larvae prey mostly on aphids but also attack scale insects, mealybugs, leafhoppers, thrips, mites, pear psylla and many other small sedentary insects. Adults of Chrysopa nigricornis are also carnivorous, but adults of most species feed on aphid honeydew and plant fluids. The egg is oval, green or white and is suspended on a long, hair-like stalk. The egg is about 1/50 inch (0.5 mm) long, while the stalk is about 1/4 inch long (6 mm). Eggs are laid singly or in groups. The larva’s alligator-shaped body is yellow or mottled gray with red or brown and has clumps of bristles. Its prominent sickle-like mandibles, or jaws, are longer than the head and are used to capture the prey and extract the body juices. 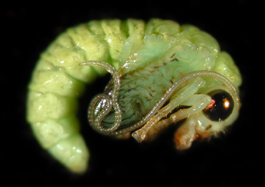 The larva develops through five instars and is about 2/3 inch (15 mm) long when mature. The larva pupates in an opaque, white or yellow, tightly woven, spherical cocoon. The pupa is green with many features visible externally. The adult is mostly green with gold markings and large, lace-like wings. It is about 2/3 to 3/4 inch (15 to 20 mm) long. Its flight is fluttery and weak. The egg is pink or white and does not have a stalk. 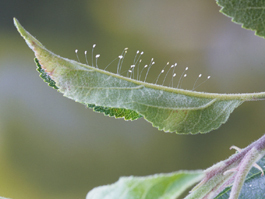 Eggs are attached to the leaf surface and are less noticeable than green lacewing eggs. The body is alligator shaped but narrower than that of the green lacewing. It has few bristles, and the mandibles are shorter than the head. It is white at first but turns brown as it matures. The cocoon is loosely woven and transparent. The adult is brown, beige or dark green with lace-like wings covered with hairs. At 3/8 to 1/2 inch (10 to 12 mm) long, it is smaller than the green lacewing. Most lacewings complete 3 or 4 generations per year in the Pacific Northwest. Because different species develop at different rates, all life stages may be present during the late season. Most lacewings overwinter as pupae in cocoons, although Chrysoperla carnea overwinters as an adult. Adults emerge in early spring and disperse. Breeding continues throughout the summer. Lacewing adults and larvae can be monitored in orchards with beating trays. The active adults are best sampled in the cool morning hours. The number of lacewing larvae needed for effective pest control has not been established. Larvae can be most easily detected by examining active aphid colonies on the undersides of leaves. Eggs are usually laid near aphid colonies and can be monitored at the same time as the larvae. 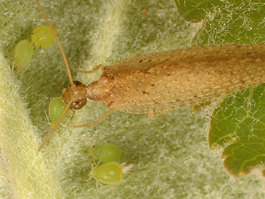 Lacewing adults will move into the orchard from uncultivated vegetation. To augment local populations of lacewings, preserve unsprayed vegetation near the orchard. Eggs of Chrysopa spp. are available commercially for mass release. Because of the tendency of adults to disperse after they emerge, introduction of eggs or larvae is more effective than adults. Adults of most species are attracted to honeydew rather than the pest.